The Thoroughbred Center's Behind the Scenes Tour offers an exclusive look at the training and stabling of thoroughbred race horses. Encompassing over 230 acres of prime Kentucky Bluegrass, this unique horse farm has the ability to accommodate over 1,100 horses. During morning training hours you will get to see horses up close while they workout on the track as well as walk through a barn where horses are stabled. Come see for yourself why trainers say The Thoroughbred Center is one of the best places in the world to train a horse. Minimum numbers are required to run this tour. Each tour starts at our main office which is located at the corner of Paris Pike and Johnston Road. Check in at the front desk and our tour guide will bring our mini bus around to pick you up. At 9:00am the bus departs from the main office. The first barns you come to are the two largest and original barns on the property and can house up to 300 horses each. This is where you will likely see the horsemen hot-walking, grooming or bathing their horse. It's all part of the daily activity. You will then pass two training tracks and then get off of the bus to stand rail-side watching morning workouts. It is likely an outrider or exercise rider will approach the group so if you've ever wanted to ask them a question, this is your chance! The group spends 20 to 30 minutes rail-side before getting back on the bus to travel to the backside. While on the backside you will see our training gate where horses learn to break from the gate, paddocks where horses spend their afternoons, hay and feed stores and more barns. As often as we can we will walk through Barn 28 and talk with trainer Mike Cameron if he is available. 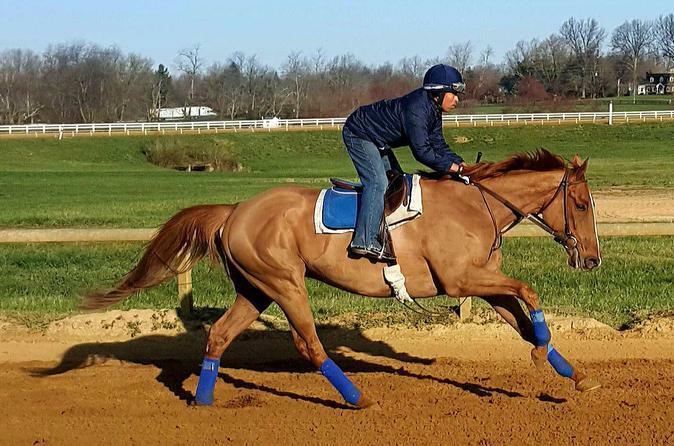 We spend about 30 minutes in the barn talking about the horses we see, how they are identified, what factors make central Kentucky the Horse Capital of the World and a myriad of other racing-related topics. He may even choose to pull a horse out of its stall! There is nothing quite like standing next to a 1,000-pound horse. So if you've ever wanted to have a Q & A session with a horse trainer, this will be your favorite part of the tour. Depending on the time of year, size of the tour group and amount of time left, the next stop may be a short walk through a gate to our neighbor, Mill Iron Farm. They have a swimming pool for horses! Trainers will sometimes choose to send their horses to Mill Iron for a quick swim rather than taking them to the track. As you head back to the main office, notice the plank wood fences that are all around you. Nowhere in the world will you see as much of this iconic fencing as you will in Central Kentucky.